The Boston Celtics second-round series with the Washington Wizards is proving to be quite the treat for Celtics fans so far. 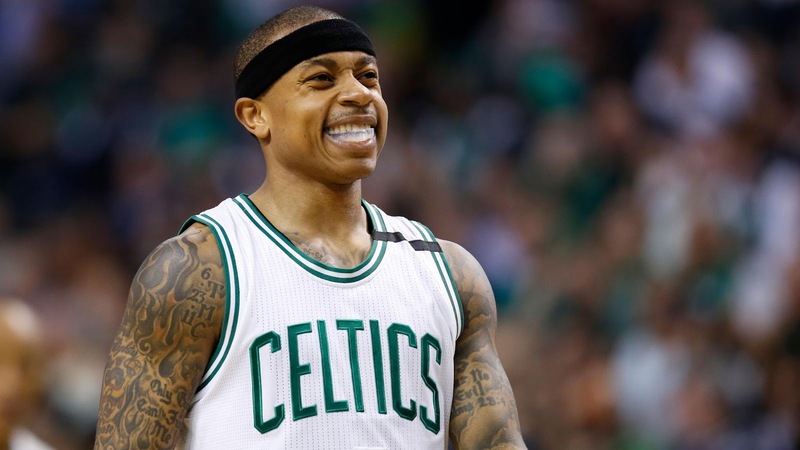 The offensive explosion we witnessed in Game Two from Isaiah Thomas was a truly legendary event, falling on what would have been his recently-deceased sister Chyna's 23rd birthday, likely at least some of the fuel torching the Wizards at the Garden for the second game in a row, but this series - hell, this post-season - has been full of all kinds of weird plot twists. For the second series in a row, opponent injury has been a significant factor, though in the most recent matchup with the Wiz, the swift recovery of Markieff Morris raised as many questions about whether it was him on the court and not his twin brother Marcus - MOST of which were in jest. The fact that this is the second series in a row playing against one half of a pair of twins (the other being Robin Lopez, whose surprisingly accurate shooting away from the basket brought similar inquiries given Brook Lopez' much better record from midrange) is also an interesting wrinkle, as was the Tooth (my favorite nickname for IT, not so keen on Kobe's "Mighty IT") losing one of his incisors while carrying his team in a very Paul Pierce- like way...who also lost a bit of his grill on-court - on what was almost certainly the Truth's last day as an NBA player, to boot. Boston lost the first two games of its first series in the aftermath of Chyna Thomas' untimely passing, but rallied and improbably defeated the Chicago Bulls in six games, only to nearly get blown out again in the first quarter of each of its first two games against Washington. That team, which has been accused of using MMA against their last opponent, the Atlanta Hawks, have been banged up pretty damn well by Boston this series, with bloody mouths, sprains galore - including Morris' gruesome hyper-extended ankle - with implications from various corners of Wizards fandom that arguably the cleanest-playing, nicest, Celtic - Al Horford - intentionally closed out underneath a jumping Morris with malicious intent. The Celts are one win away from tying their longest-ever playoff streak (seven wins, set in the halcyon days of 1986), and playing nearly as good as any time since that era, excepting perhaps 2007-08. Thomas scored the 13th-highest total of points scored by ANY player in the playoffs in league history, and came up one point shy from John Havlicek's record for most points scored by a Celt in the post-season (54) the most scored by anyone since another famous little guy, Allen Iverson, dropped 55 in 2003. In fact, only a handful of Celts have ever crossed the post-season 50-point threshold - Ray Allen, Sam Jones, and Bob Cousy. Among other teams, there's just Rick Barry, Charles Barkely, Elgin Baylor, Russell Westbrook, Michael Jordan and Jerry West. That's some rarefied air, to say the least. Isaiah just had the 13th highest playoff point total in NBA history. That's not all the history we saw being made Tuesday night, either. In a game with so much offense (and so little defense) you could easily have mistaken it for an All-Star Game if the uniforms were not a giveaway, a duel for the ages played out before our eyes. That night, unlike any which had come before it, we saw a player on one team reach forty points in a losing effort to a player dropping over fifty. Two players, 93 points. Combined, Wall and Thomas dropped more buckets than entire teams sometimes do, and only one point shy of what BOTH teams scored when Brad Stevens' Butler squad faced Connecticut in the 2011 NCAA national title game. Let that sink in. This past year, series, even this past game have all been special in ways few people could have foreseen. We have seen triumph, tragedy, and teamwork to unite the two polarities. It's caused more than a few pundits and analysts alike to not only eat their words, but do a near- 180 degrees on their professed opinions of the squad and its limits. Do we dare to dream of more than what has already exceeded most expectations of a "successful" season? Brad Stevens has not only had his first lead in a post-season series, he's made it out of the first round, with gusto. Sure, we are seeing the two juggernauts of the East and West tear through opposition like a hot knife through butter, but... well, I won't talk about it, yet - though I know more than a few of you are thinking it as well. Celtics are first team in shot-clock era to lead a series 2-0 after trailing by 10 or more at the end of the first quarter in both games. Rather than answer such a question, I'll leave you with another fact to chew on: Boston has never lost a seven-game series it led 2-0. Game 2 is must win for Wizards.